"I'm just painting," says - AYAMEKURE in her tagline. In this interview, we will take a closer look at the paintings of this Russian digital artist, as well as talk about herself and her opinions on Tolkien and art. You can see her Tolkien-related pictures in her Silmarillion gallery, and if you have tumblr, you can find her there as well. Hello! I`m JReizen. My username on the DeviantArt is Ayamekure. I started this account a long time ago, before I began to draw regularly. I like to draw digital and traditional art, but I draw digital artworks more often. I started to get involved in drawing thanks to manga. I love manga very much, and my favorite works influenced my drawing style in many ways (although I didn't notice it right away, to be honest). It happened a long time ago, and I just wanted to publish my work somewhere. I didn't draw very well then, yes .. I was also very unsociable ahaha. I created my username - Ayamekure - from my usual username - Aya. This username was already taken and I had to use my fantasy, but on other sites I use and sign my work with the name Aya (I hope this does not bother anyone). I first encountered the world of Professor Tolkien when I was little. True, then, because of my age, I understood almost nothing .. And then, when I was about 17 years old, I accidentally saw an epic scene at the end of one of the films “The Lord of the Rings”. It amazed me so much that I decided to get to know this world better and stayed here. I also read his books. After the "Silmarillion" there was no going back ahaha. The image of Middle-earth is constantly changing in my head. The more I learn about it, the brighter and richer this world becomes for me. I started with films, but the books began to influence this image much more strongly and each time they enrich it. In part, other artists also influenced this image; it was interesting to get acquainted with Middle-earth visually. But if I didn’t have my own view of things, what an artist would I be? Of course! This is so interesting! The history of this world is no less fascinating, and I really like to notice more and more new details in it, to learn something that gives more ideas about Arda, its inhabitants, and what happened in this or that era. 6. Who is your favorite Tolkien character and why? I have some favorite characters, but most of all I like Sauron. Surprising, right? I don’t know how to explain more precisely, but I just adore characters like Sauron. A delightful villain! Sly, angry, incredibly elegant in his baseness and meaniness, ready to do anything to achieve his goals. Before "The Fall of Numenor" I was not particularly interested in this character, but after I read about it and discovered him for myself, I just fell in love with this evil! 7. You have drawn Varda many times. What drives you to create this many renditions of this Valie? I love Varda almost as much as Sauron, and if Sauron is of that type of person who can be called "perfect evil", then Varda is just the opposite - true light. In the world of Professor Tolkien, in my opinion, all female characters are perfect. Without exception. Varda is the most beautiful Valie - calm, gentle, but at the same time strong and resolute. Remember? Melkor himself is afraid of this beautiful Valie. Well, hates her at the same time. I like working with her look, trying to bring it to the ideal. This is interesting - each time trying to pick up a new outfit or hairstyle for her, depict it in a different perspective or depict her with Manwe and discuss the relationship between the rulers of Arda (yes, I love this pairing). 8. Are there some topics in Tolkien's works that you are particularly passionate about? In the previous question I said already that Tolkien has all the female characters beautiful. Perhaps this is a topic that I especially like. I do not like it terribly when in a particular work or film, a female character simply merges at the whim of the author, director or someone else, but in the works of the professor I have never seen such a thing once, seriously. All his female characters are beautiful and strong, wise. 9. Now, could you tell us something about you and art? Are you a professional artist, or is art just your hobby? When did you start doing it, and who or what influenced your style? In fact, I have long been fond of drawing and even have an art education, but I began to study digital art not so long ago. 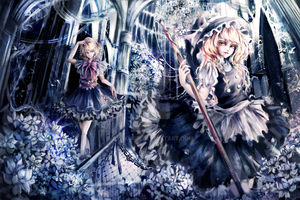 Initially, what pushed me to start drawing was anime and manga - I really liked the style and work of Japanese artists. I also always wanted to try my hand at digital art, but what then what now my style is still far from perfect. I need to draw more ahah. 10. What's your creative process from picking the theme to finishing a picture? To be honest, the ideas for my works catch up with me quite suddenly and often - not at the most appropriate time, so the most difficult thing is not to burn out and bring the idea to the canvas in the form in which it appeared. Alas, it does not always work, so sometimes the finished work doesn’t look the way you imagined it, but sometimes it does. I love to finish my work. However, more difficult than to convey the idea to the canvas, is to outline it adequately. If this succeeds, then the work usually goes on smoothly (except for the case when I updated Photoshop and still could not cope with the new set of brushes, I seriously felt very old then!) I like the process of drawing. It relaxes me and allows me to bring my thoughts in order. Focusing completely on your work, you seem to turn off the world, working with proportions, color, light and forms, space and characters. The work process is quite standard for me: sketch, line, color, shadows, and at the last stage - effects, if they are needed. As I said, I love anime and manga, and my creative journey once began with them. 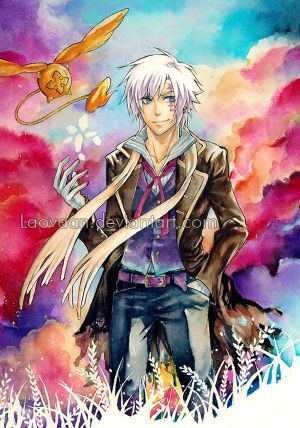 My favorite manga is D. Gray-Man by Hoshino Katsura. I cannot convey in words how much I love this story and characters from there. Now I draw fan art, either according to Professor Tolkien’s world, or according to D. Gray-man, but before that I often drew on Heroes of Might V and Magic (I still love this game, but I still can’t take the time to go through to end). And I love to create crossovers! Basically, I adhere to a single style in my works, but this does not prevent me from perfecting it, but, in fact, I need to train more to paint more painterly works. I want to experiment more with the technique of blending colors, with light and angles, and I will definitely do it. I do not want to stagnate in one place. Well, perhaps - general advice given by teachers to their students in art schools, such as “going from the general to the particular”, “squinting at the work more often,” and “looking at its miniature in the corner of the program, or, if you draw on paper, look at your work from afar. " And, of course, practice more! 14. You also have a blog in Russian, where you post you art, but also writing. What do you write about? Oh, you already know that ahaha. In my Russian-language blog, I mainly talk about the progress of the work done and share story sketches on its subject - what thoughts did I have while I was drawing it and what I would like to see from it again (from myself). Sometimes I also write stories when I am very inspired by one or another plot. This is my last portrait of Varda. It is difficult for me to do paintings, but here I succeeded. This is my favorite illustration. I hope you do not mind that this will be a picture from another blog. Not to put into words how I suffered, while drawing it. 16. Would you like to thank somebody here? What key people in your life, (on or off of dA) have been inspirations to you, or has supported you, as an artist? You can also tell us why, if you want. Well, I have some close friends who supported me from the very beginning, and I would like to thank them - thanks to them, I have not lost faith in myself and continue to draw. There are also several artists whose style and works inspire me. I look at them and I want to improve! Well, first of all, I would like to thank all those who like my work - it really makes me happy. And I hope that the work of Professor Tolkien will inspire more than one generation of his fans to create something really beautiful. Thanks for another cool interview! By the way, I don't think "beletry" is a word in English... I see that in all of your interviews and have no idea what it means and can't find it in a dictionary. Do you mean "belles-lettres" which is also not a common word? Ohhh right, I see! Yes "non-fiction" would be its opposite! Enjoyed the interview very much.